Imagine visiting a magical land where you can gaze at a replica of Van Gogh’s Starry Night created entirely out of sugary sweets, jump into a gigantic ball pit filled with fluffy marshmallows, and experience colorful, larger-than-life candy displays perfect for Instagram photo ops. Sounds too good to be true? Think again! At Candytopia, an interactive, candy-themed pop-up, dreamed up by Jackie Sorkin (CEO of The Hollywood Candy Girls Inc., esteemed candy stylist to celebrities like Kim Kardashian West and Oprah Winfrey, and star of the hit TLC TV show Candy Queen), you can traverse through more than a dozen immersive art installations and exhibits that were created using thousands of different pieces of candy. Since Candytopia’s grand opening in LA on December 15, the pop-up has drawn in candy fans from across the globe, and on August 15, Candytopia is relocating from Santa Monica, CA, to Midtown Manhattan in New York City’s Penn Plaza so that those on the East Coast can experience the charm and wonder of this “sprawling sanctuary of confectionary bliss” for themselves. Read on for a rundown of everything you need to know about Candytopia, from the best exhibit spots for like-worthy Instagram photos to what you can expect to see, smell, taste, and touch in this whimsically sweet art installation. Upon entering the Candytopia lobby, guests are greeted by expert tour guides and entertainers who are as friendly and fantastical as the colorful characters from Willy Wonka and the Chocolate Factory. 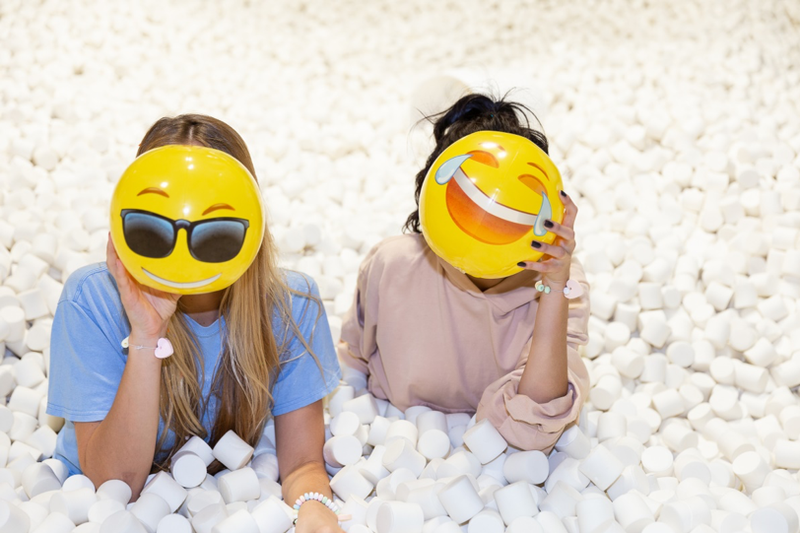 On social media, Candytopia has been deemed an Instagram-lover’s paradise, and with good reason—some of the highlights of this immersive, candy-coated experience include a room filled with sugary recreations of some of the world’s most popular art pieces and landmarks, like the Great Sphinx of Giza and The Mona Lisa, a beach-themed room where visitors can strike a pose on a surfboard placed next to a giant candy shark, and a Victorian steampunk parlor where you can find a life-sized suit of armor made entirely out of candy! Make sure to get a whiff of each piece of artwork as you view it—since all the installations in Candytopia are made of real candy, they’ll smell just as good as they look! Don’t worry about running out of time to take the perfect photo while visiting Candytopia; one of the biggest perks of this interactive candy installation is that each guest is granted a full 15 minutes to spend in Candytopia’s most popular attraction area, the marshmallow pit, and in the rest of the exhibit rooms, visitors are free to roam as they please for as long as they’d like. Let the photoshoots begin! As you make your way through each of Candytopia’s one-of-a-kind interactive rooms, prepare for your sweet tooth to be satisfied like never before! An assortment of gummies, hard candies, chocolates, and other sugary confections will be generously distributed to visitors throughout the course of the Candytopia experience. After exiting the installation, keep the sweet streak going by stopping by Candytopia’s colorful gift shop, where guests can find rare, imported candies and chocolates, authentic Candytopia merch, and even a pick-and-choose candy wall so you can grab a bag of all your favorite sweet treats from Candytopia to-go! Whether you’d like to include a visit to Candytopia on the itinerary for your next incentive trip, or you’re hoping to host a private corporate event in this rainbow, candy-themed wonderland, contact GMS today for a personal proposal to make your next special event in NYC very sweet! Last week, The Roxy, a historic New York City hotel known for its unparalleled location in the heart of Tribeca, one of Manhattan’s trendiest, liveliest, wealthiest, and most architecturally stunning neighborhoods, announced their nomination for the Travel + Leisure 2018 World's Best Awards. This nomination arrives following the hotel’s completion of $15 million dollars in renovations toward The Roxy’s dazzling public spaces, rooms, suites, and entertainment venues! Thanks to The Roxy Hotel’s unrivaled array of options for dining, shopping, relaxation, and entertainment, there are endless opportunities available for those looking to enjoy a travel experience with their group at The Roxy that is truly one-of-a-kind. Perhaps the biggest draw of The Roxy Hotel is The Django, a hip, cult subterranean jazz and cocktail lounge where guests can take in the sweet, soulful melodies of saxophones and grand pianos while enjoying wine, spirits, specialty cocktails, appetizers, and gourmet desserts in the comfort of The Django’s plush, low-lying leather and velvet seating. After you take in toe-tapping tunes played by the best jazz musicians NYC has to offer, stop by The Roxy Hotel’s Roxy Cinema, an intimate 118-seat cinema in downtown Manhattan that features stunning, Art Deco-inspired design elements, mouthwatering craft cocktails, and a lavish, gourmet concession stand filled with delicious meals and treats to eat as you enjoy your film. Unlike traditional movie cinemas, The Roxy Cinema prides itself on showing unique films that cannot be found elsewhere; first-run independent films, 35mm cult classics, and rare archival prints are just a few of the standout film selections available for viewing at Roxy Cinema. The excitement doesn’t have to stop there! The ground level of The Roxy Hotel is also home to Jack’s Stir Brew, a premium coffee shop that brews unique, organic fair trade coffee (using a special stir brew technique to produce drinks with richer flavor), loose leaf teas, high-quality espressos, and delicious, vegan baked goods. After you fill up on The Django’s hand-shucked oysters and specialty cocktails, enjoy an independent film at Roxy Cinema, order a shot of Jack’s famous triple ristretto espresso, and take in some of the sights and sounds of New York City that aid in making The Roxy so special, it’s time to go back to your luxury hotel suite to relax and unwind. Fortunately, resting into a state of calm and tranquility is quite simple at The Roxy Hotel! The Roxy is home to 201 exquisite guestrooms, 40 grand multi-bedroom suites, and Penthouse 8, the stunning, two-story pied-a-terre complete with private access to an exclusive rooftop terrace, 900 square feet of areas to relax, work, and sleep, and stellar floor-to-ceiling windows that provide guests with a panoramic view of the most stunning skyline sights in Lower Manhattan. For groups seeking travel incentive opportunities that combine the best of art, entertainment, nightlife, dining, and relaxation in a luxurious city setting rich with vitality, history, and culture, The Roxy provides guests with a slice of New York City paradise that is certain to make your next corporate event one that will be remembered forever! Contact Global Management Services today for your personal proposal. (All photos courtesy of The Roxy Hotel website).